Too many corporate websites look eerily similar, says Scott Payton. But there are notable exceptions. I spotted a teenager in London on Saturday with this slogan on their T-shirt: ‘The Same is Lame’. This got me thinking, mildly tragic though it may sound, about corporate websites. I’m talking about how many of the latest sites look here, rather than things like menu structures. As we’ve often said, when it comes to site navigation, ‘the same’ is not at all ‘lame’: a conventional set of primary and in-section menus is a huge asset in helping visitors to quickly find things without getting lost. But the opposite is true for visual design. Having a corporate site that looks much like many others undermines attempts to convey a distinctive impression of a business and entice visitors in. Yet so many major corporates sites launched in the last few years look spookily similar. First, the grid-like structure of sites that employ responsive design – especially the earlier ones – has encouraged a visual sameyness between them. Second, it’s probably cheaper and easier for web design agencies to build sites that look homogenous – drawing on their existing repositories of templates and other design elements – than to ensure that each client’s website is visually unique. Third, it’s perhaps easier for corporate web teams to win bosses’ and other department heads’ sign-off for a site that looks modern, but in a rather ‘vanilla’ way, than for something more aesthetically radical. Clean, eye-catching diagrams, an appropriately no-nonsense font (Zetta) and a maritime colour scheme combine to give this Danish transport group’s site a fresh look that effectively conveys an impression of a modern and unique global business. The diagrams are not just window-dressing; they do an important jobs of explaining the various things that Maersk does. See this Company Structure page for an example. Finding interesting imagery to illustrate corporate governance may sound difficult – perhaps impossible. Yet this French insurance group has done it. 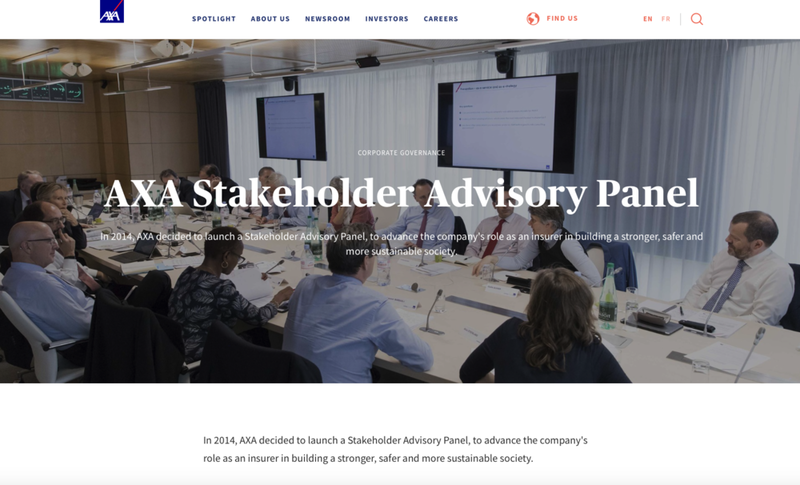 On the Stakeholder Advisory Panel page, the company not only talks about the panel – including minutes from its first meeting and a rundown of its members – but also shows the panel in action, through high quality, journalistic photography. This humanises the topic in a way that no amount of description could do. Meanwhile, the corporate ‘stories’ on AXA's website have the feel of a contemporary online cultural journal, thanks in no small part to the use of photography. There are enough high-quality pictures on most AXA stories to count as a pictorial diary – but they are spread out throughout the piece instead of bunched together in a single carousel. This not only adds visual interest, it also gives visitors an incentive to scroll all the way down the page. Even visitors who scan the page without really reading it may take away a strong impression of the company (as an employer, especially); concise and intriguing captions help to ensure this. This US entertainment giant is renowned for its attention to visual detail. On its corporate site, this includes the look of its share price chart – which employs fonts and colours that are distinctly Disney. The rest of the site is similarly soaked in the company’s iconic imagery – though, as David Bowen explains here, the slick visuals are not matched by slick usability. While Disney festoons its site with its brand colours and characters, Facebook has ensured that key parts of its corporate web presence – such as its Careers pages and news archive – echo the appearance of its millions of customers’ Facebook pages. The result is a site that looks unique, in a way that powerfully reinforces the company's brand. 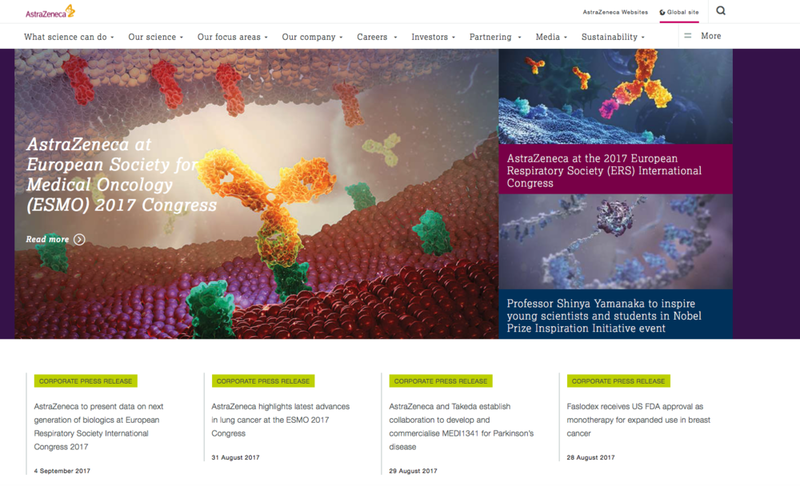 The Anglo-Swedish pharmaceuticals group makes assured use of original illustrations and semi-abstract photography to make its corporate site stand out while also communicating something very on-message about the highly-specialized nature of the company's work. The artwork references the strange beauty of things the company might see under the microscope in its labs – complemented by bright, distinctive photography. It's another useful reminder that when it comes to design and visual impact, looking just to the side of conventions and norms can yield memorable – and certainly not lame – results.